Now that President Obama is preparing to sign the $787 billion economic stimulus bill tomorrow, it is worth taking a look at what Republicans - who fought it tooth and nail to the tune of zero GOP votes in the House, and three in the Senate - are saying and doing. Arizona Senator John McCain, for instance - apparently stricken with blindness to the Clinton budget surplus squandered under 8 years of Republican rule, and the bottomless financial vortex that is George Bush's war of choice in Iraq - termed the stimulus bill "generational theft". With this type of rhetoric in play, one might reasonably expect that GOP legislators will want nothing to do with the public money to be disbursed under the stimulus package which they so vociferously opposed. One would also be widely off-base. Specter, along with centrist Maine Republican Senators Susan Collins and Olympia Snowe, joined with Democrats last week to move the stimulus bill forward. Specter said he doubted there would be any more Republican votes than those three Friday night. Specter was asked, How many of your colleagues? "I think a sizable number," he said. "I think a good part of the caucus agrees with the person I quoted, but I wouldn't want to begin to speculate on numbers." Perhaps this shouldn't be surprising, since the dirty little secret of Republican-dominated states is that they are so often the polar opposite of the rugged, self-reliant, individualists portrayed by GOP leaders like Ronald Reagan and George W. Bush. In fact, based on a study by the Tax Foundation, as of 2005 (the most recent year for which data is available), of the states taking in more federal dollars than they contribute in taxes, 8 of the top 10 - and 15 of the top 20 - voted for John McCain in 2008. To be sure, there is nothing wrong with wealthier parts of the country helping states that have less - after all, we're supposed to be in this together, as Americans - but it gets more than a little tiresome when the poorer relations routinely lecture their meal tickets on money management and fiscal responsibility. 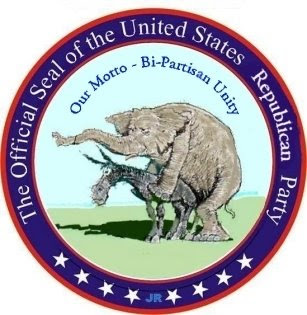 In any case, what is most important, is that it is now very clear that a number of Republican legislators completely abdicated their duty to advocate policies they personally believed were in the best interest of the nation. Certainly, they should represent the wishes of the people whom they serve, but it is also their responsibility to shape public opinion in support of necessary policy. Instead, these Republicans effectively ceded their constituencies to people like Rush Limbaugh - who has made it clear he wants Democratic policies to fail far more than he cares whether the country recovers - but now have the gall to accept the benefits of the stimulus package, and even claim credit for projects it brings to their states. This is party before country at its worst. Great graphic. Too bad you didn't get the action one!!! Yeah, the Rethugs are all over the 'toobz' claiming credit for stuff that either is or isn't in the bill - at the same time screaming for all they're worth that they 'had no input'. Do they even listen to themselves? Uh.....no. Self-awareness has never been a strong suit for the modern GOP.